Well, not quite. 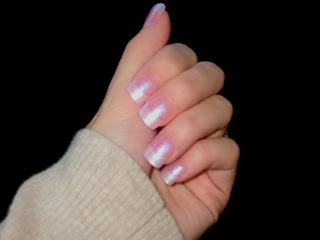 These are a pearl white tip with Cotton Candy topcoat. I needed to go neutral for a little while ... I love colored tips, but was getting bored with them. The Cotton Candy added just a bit of color, and I like that it muted the tips a bit. What a clean French! Looks fab! What brand is that Cotton Candy? Very pretty! When I used to get my nails done, I usually went au natural but occassionally I'd use a color like this.